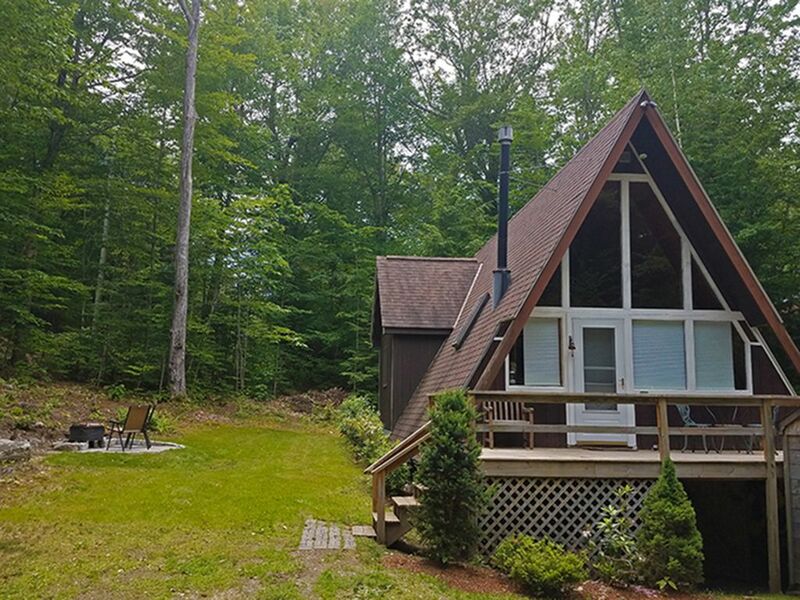 2BR Cozy, Updated, Pet-friendly Chalet-AC, Fire Pit, 3 min Walk to the Beach! Welcome to the GetAway! Cozy pine walled 2 bedroom A-Frame a few minutes’ walk to beach on Big Pea Porridge Pond. This is a great place to stay in the middle of everything – hiking trails, ski-mountains, snow mobile trails, boating, and swimming. When you’re done with your outdoor fun you can visit North Conway (just 15 minutes away) for some great shopping and restaurants. Pets are welcome. MAIN LEVEL: large cathedral ceiling living room which opens onto a large kitchen. There’s a flat screen TV with cable, a gas-log stove, couch and comfortable futon sofa/bed, table and chairs for dining and 2 stool chairs at a breakfast bar near the kitchen. Downstairs bedroom has queen sized bed and large closet. Bathroom has a walk-in shower. UPSTAIRS: second bedroom with double bed and open loft area which could be used for extra guests. *A $25 REFUNDABLE garbage fee will be added to your total. Guests are asked to dispose of their garbage/recycling. You will be provided with a pass to the local transfer station. If you leave your garbage on the property, the cost is $5 per bag left behind. At the end of your stay, your fee will be refunded accordingly. The place was as described and even better in person. Location was perfect with shops and skiing a short drive away. Would definitely stay here again if I’m in the area! Thank you for staying with us! We're glad you found the location to be so perfect for your stay. Please visit again and have a wonderful rest of the winter! Great place to stay and great price! The only issue we had is the plow guy didn't come till 230. When he did he only plowed 1 swipe so he had to come back to plow the rest of the driveway and sand. We lost a whole day skiing because we had to shovel ourselves out which took a good 4 hours. We still couldn't get out till 5 because he didn't sand till then. Other than that it was perfect. Very cozy! Plenty of clean sheets and towels. We are glad you found the home to be private, cozy, and well-located, and that it had plenty of space for your dog! Unfortunately the heavy snows and many storms have made things especially challenging for the local plowing companies this year, but we are doing what we can to rectify the issue and apologize that it caused an issue! Please visit again! My family had a great visit to Madison and this charming little A frame cottage. Centrally located to get to North Conway and skiing. Bedding could use some updating unless you want to bring your own. We had an issue with the door code checking in but a quick call and they had us in within minutes. Thanks for staying with us during your ski vacation. Please consider using us again if you are planning another trip to the Mt. Washington Valley! The rental was very clean and very close to everything we wanted to do. The staff at the rental agency was exceptional! Thanks very much! We are so glad you stayed with us! We stayed here in October during peak foliage. Everything about our stay was great. The cottage was immaculately clean, and there were very clear instructions about how to work everything. The little lake, only a couple minutes walk from the house, is clean and quiet (no motor boats!). Great for kayaking. We appreciated having kayaks on site so we didn't need to haul ours from home. The place is just far enough away from the frantic pace of North Conway but close enough to easily access the Whites. The only thing that could improve the cottage would be a washer and dryer. The faucet water was very good - no need to bring in bottles.We would highly recommend this place for a couple or small family. No view as it is surrounded by woods, but the lake is very near. Thumbs up!! Sounds like a perfect getaway! Thanks for your review. We are so glad you enjoyed this home, and we look forward to having you back!